The first thing to remember is there have been many studies, and conceal and carry holders commit fewer crimes than the general population. In fact, they have fewer gun accidents and shoot fewer people by accident than cops do. Which makes perfect sense for those who can reason it out. Imagine, "if you had a gun, what would you do in situation X, Y, or Z?" The answer for most human beings, knowing that a gun is a major escalation and increases their odds of getting shot, sued, or shot and then sued -- is that they would only pull it out in the most extreme of circumstances. Those that don't, quickly get charged with a felony of brandishing a weapon (malicious intent), and they lose their gun rights, forever. So being a responsible gun owner is a quickly self-correcting problem. The ignorant and hopolophobics (gun-phobia), think that a gun makes people more likely to kill someone. Actually, the statistics appears to be the opposite. Because a gun is a dangerous escalation that can end you in prison, most people with guns are more likely to be polite and de-escalate confrontations with others. Which is why they are involved in so many fewer crimes. These folks will say things like, "I'd be uncomfortable knowing someone might have a gun". But if they've ever visited any of the states with liberal conceal and carry laws, they've already been exposed to people who were carrying, they just didn't know it. And the truth is, their fear is irrational. With a little training, someone could easily kill you with their hands, knives or something as a club. In fact, those weapons kill more 20x people per year in the U.S. than assault rifles, not to mention automobiles, so fear of citizens with guns is irrational and based on ignorance of the facts. No-issue - this means no one can get a license to carry. With overturning Illinois's laws (in 2013) as unconstitutional, there are technically no, "no issue" states in the nation. Illinois (Chicago) had one of the highest murder rates in the nation, before that repeal -- and when this was repealed, the gun controllers said it would lead to a blood bath. Since then, their murder rate and crime rate has gotten better. May-issue - a few states are "May-issue" states/counties, which usually means you have to prove a need, before your constitutional right to carry will be honored. And since they set the bar above what non-politically connected mortals can achieve (unless there's an unusually large donation to the local Sheriff), they're defacto "no-issue". There are multiple lawsuits winding their way up to the Supreme Court, to rectify this, but the process is slow. Hawaii, Maryland, New Jersey, Rhode Island (and Puerto Rico, U.S. Virgin Islands) are no issue. And counties within California, Massachusetts, New York are no issue. Historically, and generally, there's more crime and murder in places that stop issuing, than in places where they are issued. Shall-issue - most of Free America (the part that believes in the law/Constitution), has shall issue. Which means if you haven't committed a felony, dishonorable discharge, are accused of domestic abuse, are not mentally incompetent, and so on, then you are allowed to get a Concealed Carry permit. Constitutional Carry - unrestricted carry is a step further. It basically says that you don't need a license to have free speech or the right to carry a gun (concealed or open). Most of these states have lower than average crime and murder rates, and have seen them go down faster than the national average since enacted: Alaska, Arizona, Arkansas, Idaho, Kansas, Maine, Mississippi, Missouri, New Hampshire, North Dakota, Vermont, West Virginia and Wyoming. What we know is that during the 1960's and early 1970's we installed a lot of gun control, and with the exception of the civil war (or some turn of the century/great depression anarchy/violence), we saw our crime and murder rates go up. Maine and North Dakota noticed that, and in 1985 decided to follow suit. The left predicted allowing more people to get a Conceal and Carry permit would result in a bloodbath. Crime and murder rates dropped. South Dakota followed suit in 1986. The left predicted allowing more people to get a Conceal and Carry permit would result in a bloodbath. Crime and murder rates dropped. Florida had noticed that in and 1987 and decided if allowing people to defend themselves seemed to have no negative effects on society (and some positive ones), that they'd try it, and they became a "Shall Issue" state as well. This was a much bigger fight and got national attention (which is why Florida is often credited with starting the trend amongst the states that followed). The left predicted allowing more people to get a Conceal and Carry permit would result in a bloodbath. Crime and murder rates dropped. Crime and murder rates dropped so much in Florida, that many other states started following their lead. Each new state to do this, lead to cries from the left that it would result in a bloodbath. And each time, their 'crime and murder rates dropped. What has never happened is that the progressive gun-controllers were ever right. 2008 in D.C. vs Heller, the right of individuals to own guns was re-affirmed, and ruling that gun controls enacted by D.C. were unconstitutional. (The right of an individual to own and bear arms was not tied in any way to their enlistment in a militia). The left said there would be a bloodbath. Crime and murder dropped. 2010 Chicago, Illinois, had a virtual ban, and lost McDonald v. City of Chicago . The left said there would be a bloodbath. Crime and murder rates dropped. D.C. was forced to allow people to own guns in Heller, but they had created all sorts of new rules restricting them from carrying them.And Palmer v. District of Columbia in 2014 slapped that down. The left said there would be a bloodbath. 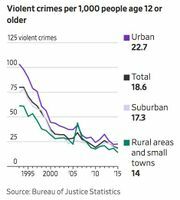 Crime and murder rates dropped. As more states enacted CCW's, and some cities/states were forced to give up their left-leaning anti-Constitutional positions on Gun-control, and never has there been a statistic that showed this resulted in a significant increase in crime or murders. If they had, the left and media would have been all over it, and used it to drive the message home that respecting the Constitution is a "bad thing". To show you how absurd it is, Congress passed National Reciprocity, but it's hung up in the Senate. (Think of it like Gay Marriage laws: that one state can't ignore another state's Conceal and Carry permit). As you can imagine, the left is suddenly re-discovering the 10th Amendment and State's rights -- only State aren't allowed to intrude on constitutionally granted liberties, so they're destined to lose, eventually -- assuming we have enough constitutionalists (and not progressives) on the court. You can see how they handled by reading Nancy Pelosi's tweets. The tweet demonstrates the point. According to her, those evil Republicans are "inviting" criminals, domestic abusers, and stalkers to carry weapons. Only, felons are not allowed to own guns, let alone carry them -- and all the things she mentions are crimes. And if they're guilty of crimes (convicted or not), then they're both not allowed to carry a gun for that purpose, and a law is already proven to be irrelevant to them (so a law against CCW wouldn't stop/slow them). So all that laws for CCW can do is allow a process by which non-criminals can ALSO carry weapons (as well as criminals), if they so choose. 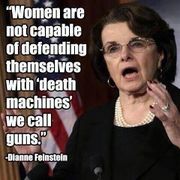 While this quote by Feinstein is unproven (and I'm skeptical of it), it does fit fragments of what she has said elsewhere about guns (being killing machines, and all civilians (Women or otherwise) are unable to handle such awesome killing machines: unless they're politicians, the military or police). In fact, she's said worse like if she could get the votes, she'd ban every one of them (screw the Constitution), or that in a mass shooter situation, if you lay down your gun, the mass shooter will do the same. I'd like to see her try that one. Which goes to prove: never trust a Pelosi, Feinstein or other Gun Controller. Gun controllers come in two flavors: liar (politician) or stupid (voter). Now I know that's not completely fair. Somewhere out there is an informed gun controller who isn't being dishonest... and someday, I'll meet one. But after 40 years of discussions on this topic, I haven't met one yet. And I obviously hold the legislators to a much higher bar than the well intentioned but ignorant voters that support them. So the class I took was by Gun Kraft in San Leandro Rifle & Pistol Range (basically Oakland, CA), from a very good instructor (Robin Yang). I went with a friend, so we made a half day of it, and grabbed some In-N-Out as a reward for completion. It is a 5 hour training, and would allow us to get our CCW's. Some states require more, some less. But this would allow us to apply for one or a few of the states that allow non-resident CCW's. (This is a convenient thing to have if reciprocity ever passes the Senate: which could easily happen if Republicans win big, or Democrats take back congress -- as with the Republicans being lame ducks, they have nothing to lose by passing it). This course covered basic gun operations, safety, the law, different ways to carry (and the advantages), safety again, scenarios of when to fire or not (using airsoft guns), proper draw techniques, safety, and quite a few case studies (basically YouTube videos) of how things can "go down". It's sort of like a Drivers-Ed class for guns. And of course they do the prudent thing by explaining that 40 hours of training is certainly not too little for people's continuing education. The problem is every state, and even districts vary, so you're not going to get on-top of everything in one class. (E.g. like a learners permit, this is the starting point, not the conclusion in training and certification). I've already taken at least 40 hours in my life, of various forms of combat shooting courses. (And a few thousand in Martial Arts in general). But still, every time I go, there's something new to learn, or at least refresh and remind myself of. So they're never a waste. Like all skills, it's fun to practice and master. In the class we had ≈10 people -- 9 or which seemed competent, engaged, and asking questions about this or that (showing interest in really knowing the law, or how to act when you're carrying). Only one guy seemed less than proficient: and my concern wasn't about his lack of proficiency with operations (he had lousy trigger discipline, poor understanding of operations, etc), he also didn't seem very good/interested in listening to people who obviously had more experience than he did. But such is life. To me, that demonstrates the reality of CCW in general. Since most people are fundamentally good -- if you gave everyone a license to carry, then the gross majority of the time, guns would only come out at appropriate times, and most people are going to want to know how to operate the tool safely (just like cars). But there's often one knucklehead, that in a car will speed, drive like an idiot, and just be a bad citizen. Fortunately, that's usually a self-correcting problem. In the end, I enjoyed it -- and it's sad that California is going to fight to the bitter end. They're against the Constitution, common sense, and willing to ignore all the evidence we have that their forms of gun control (instead of teaching gun responsibility), doesn't actually work. And they're looking for the outliers -- the one idiot, to "never let an opportunity go to waste", to take our liberties away from us, for their own good, of course. Remember, if you are for gun control, then you are not anti-gun, you are pro-Gun and Pro-Cop, because it will take guns and cops going door to door to disarm people. You just believe that the Government is so reliable, honest, and virtuous (as are criminals), thjat they should be the only ones allowed to have guns. There is no such thing as gun control. There is only centralizing gun ownership in the hands of a small, political elite and their minions. There are cases where CCW holders shoot people. The numbers are often exaggerated by throwing in Suicides (which has nothing to do with guns). This anti-Constitution site shows 1,100 total over 11 years, with >90% being suicides -- leaving <10/year. And it only does that by over-counting (adding individuals to more than one column, or not counting that some were cops or military). So the point is that you can find a handful per year, if you look hard enough. Of course compared to half million or so that died to murder/suicide over the same period of time, it's nominal. And the facts are still that CCW holders are far less likely to commit these things than the general population.